The Palais des Papes. All photos Courtesy of Alain Hocquel/Collection CDT Vaucluse. Avignon—City of the Popes—is not Rome, and the Palais des Papes is not the Vatican, but the city has retained its ecclesiastical splendor from the period 500 years ago when it was the “other Rome,” ruling the Christian world while its Italian counterpart remained popeless. Surrounded by French towns determined to expel or eliminate their Jews, the popes welcomed them, resulting in a Jewish community that may well have vanished otherwise. The Pope’s Jews, as those Jews were known, is a true oxymoron. How well they were treated depended largely on the whims of the sitting pope. Avignon, located in southeastern France in the now-chic Vaucluse region, was founded in the 10th century B.C.E. by the Celts on the rocky outcrop known as le Rocher des Doms, a natural shelter high above the left bank of the Rhône River. It became an important port after the founding of Hellenistic Massilia (Marseille) in the sixth century B.C.E. Jewish merchants were brought along by the Greeks. Former Roman soldiers planted vineyards in the rich soil surrounding the area, which they called Avenio. Alongside the Romans, Jews also grew grapes, calling the city Ir ha-Gefanim, “city of the vines” in Hebrew. From the first through the mid-13th century C.E., during Greek and Roman occupation, Jews lived on just five streets. All of the houses were demolished, but a sign reading Rue Vielle Juiverie (street of the old Jewish quarter) remains. This entire region, known as the Comtat Venaissin, was ceded to the Holy See in 1226. Though Avignon was purchased by papal authorities in 1348 from Jeanne, queen of Naples and countess of Provence, it had already become Altera Roma (other Rome) with the arrival in 1309 of Pope Clement V. Seven popes and two antipopes ruled in Avignon while Rome remained turbulent and popeless until 1377. Jews expelled from southeastern French provinces in the 14th century found refuge here. The popes and apostolic legates who succeeded them had an open-door policy exclusively for Jews. They settled in Avignon and three nearby cities (L’Isle-sur-la-Sorgue, Carpentras and Cavaillon) in carriéres des Juifs, pre-Venetian ghettos that the popes staffed with Christian gatekeepers—paid for by the Jews. Jews called these confinements arba kehillot, in reference to Israel’s four holy cities. The popes viewed the Jews as despised, homeless wanderers who had not recognized Jesus as the messiah but had to be preserved. They could survive but not thrive, relegated to moneylending, secondhand textiles and brocante (used furnishings). The Pope’s Jews remained captive in the region until the French Revolution in the late 18th century, when France became the first European country to emancipate its Jews. Once free, they made important contributions in music, literature and philosophy, while developing significant scientific and medical advances. They also continued their traditional trade in textiles, second-hand goods and finance. After the Holocaust, there were some 150 survivors but, after 1960, an influx of North African Jews brought the population to 500. Today, there are close to 1,000 Jews prominent in commercial activities and retail as well as at the university, in medical research, politics, textiles and finance. The municipal-owned synagogue located at 2 Place de Jerusalem is presided over by Rabbi Jonathan Sfadj (011-33-6-18-85-67-13; rabbin.acia@free.fr); the services follow a mix of Ashkenazic and Sefardic rites. The Community Center Emmanuel Eydoux (18 Rue Guillaume Puy; 33-6-66-06-37-77) is an active cultural destination with exhibitions, concerts, lectures, dances and readings as well as Sabbath dinners, Seders, holiday celebrations and Talmud Torah classes. 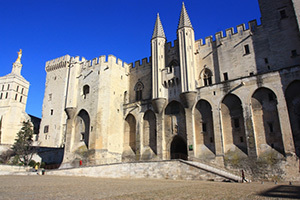 The most significant sight in the City of the Popes is the imposing papal residence (www.palais-des-papes.com)—Europe’s largest Gothic palace, the equivalent of four cathedrals. There are myriad ceremonial rooms, chapels, private chambers, baths, wardrobe rooms and reception areas decorated with imposing, often gilded, frescoes. The neighboring Musée du Petit Palais has a splendid collection of Italian religious paintings. Wandering the narrow, winding streets, one discovers chateau museums with exhibitions of prehistoric, Greek and Roman objects, natural history, decorative arts, archaeology and the picturesque former pawnbroker’s house featuring a collection related to silk works. The ramparts—built in the 12th century atop traces of the old Roman city—were reconstructed by the popes in the 14th century. They are the finest examples of medieval fortifications anywhere in Europe. There are 35 massive defensive towers with seven gateways still serving as entrances to the historic heart of town. A great place for a rosé or pastis and people watching is the central Place de l’Horloge (Clock Tower Square), with the majestic 19th-century neo-Classical City Hall and Opera on one side facing the cheek-by-jowl cafés and antique carousel on the other. The Place Pie covered market, Les Halles, has 40 stalls selling local food year-round. Wander behind the popes’ palace to see the Pont St. Bénezet, the legendary Avignon bridge, built in the 13th century. Damaged by wars and flooding, only 4 of the original 22 arches remain. Children everywhere have sung “sur le pont d’Avignon, l’on y danse, l’on y danse” (one dances on the Avignon bridge). Stroll through the sprawling Rocher des Doms gardens overlooking the Rhône with splendid views of the city. A ramp from this green sanctuary leads to the top of the city walls—the only part of the ramparts you can walk on. After passing several turrets, one arrives at the Avignon bridge. There are ferry crossings to reach the walking paths along the Rhône banks and access to Barthelasse Island, France’s biggest river island. The Avignon synagogue has been built and rebuilt multiple times. A Jewish school and synagogue first appeared in the Place de Jérusalem soon after Jews moved here in 1221. It was replaced in 1348 with a magnificent, richly ornate synagogue that fell into a dilapidated state over the centuries while serving the increasingly impoverished community. But, during the 18th century, the Pope’s Jews were allowed to travel to markets in Provence, wearing black hats instead of yellow ones to avoid being harmed. With amassed great wealth, in 1766 they underwrote the synagogue’s renovation. 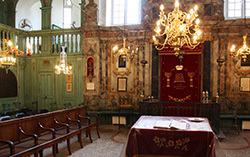 However, during the French Revolution, the synagogue was handed over to the city of Avignon. In the Reign of Terror that followed, Judaism was outlawed. The synagogue became a national property placed at the city’s disposition. The old synagogue’s demise came in 1845 when an accidental fire on the lower level destroyed the building and the community’s 42 Torah scrolls. The Christian architect commissioned by the municipality built a new synagogue that looks more like a Greek temple than a Jewish one. The neo-Classical rotunda has an encircling balcony inside a square building with Ionic white columns and sober walnut furniture. The rabbi’s pulpit is reached via a staircase winding up around a white column above the congregation. The only link with the past is the 14th-century matza oven, deep underground, plus the cemetery outside the city fortifications. 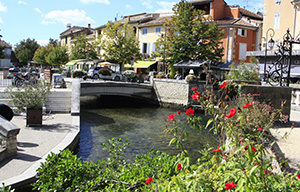 Of the four “holy cities,” L’Isle-sur-la-Sorgue is the most picturesque. Called “Venice of the Comtat,” the Sorgue River soars through canals with rusted-over water wheels poised as if in silent homage to the Jews whose silk and wool production played a dominant role centuries ago in the town’s economic welfare. The 14th-century synagogue was destroyed during the Reign of Terror. Tell-tale remnants are the sign Place de la Juivere (Jewish Square); the Rue Hébraïque (Jewish street) in the carrière; and a semicircular, high maison Juive (Jewish apartment building). The only surviving element from the synagogue is the grill that separated women from the men, now used in the local cathedral to separate parishioners from the altar. The city recently restored the 14th-century Jewish cemetery. Carpentras is home to the oldest still-functioning synagogue in France, dating from 1367. Since its 18th-century restoration, congregants must pass under cruciform windows—imposed at that time by the bishop—to reach the upper-level prayer rooms made gloriously rich with Louis XV-style chandeliers, neo-Classical columns, faux-marble walls, carved rose motifs and Provençal color. 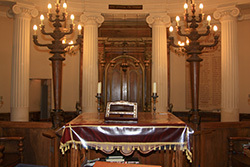 The rabbi’s chair sits on a balcony over the main sanctuary. The rabbi then officiates from a pulpit with a baldachin, above worshipers and the Ark. As in all Comtat synagogues—the other surviving one is in Cavaillon—there is a niche near the Ark with a miniature chair for the prophet Elijah, who traditionally descends to witness circumcisions. The largest, most beautifully decorated space was always reserved for the men. Comtat women were relegated to a cave-like underground area, topped by a low ceiling and closed off by a grill. They could not see the service but followed it through a sound tunnel. The women could only lift the grill to peek out when the Torah scrolls were removed from the Ark. Fourteenth-century vestiges remain. One descends 48 steps to the medieval mikve, whose square-shaped pool and basins are fed by natural spring water. On the lowest cellar level, there is the original bakery with ovens for daily bread and special bread for the Sabbath as well as ovens to bake the matza for Passover. In Cavaillon, the synagogue was completely renovated in 1774 above the Rue Hebraïque—the last remaining Comtat carriére, a narrow street where the Jews lived in squalid conditions and were locked in at night. Its interior, like a fashionable 18th-century boudoir, has carved wooden panels, intricate wrought iron and other elaborate decoration. The small, square-shaped main hall has a high ceiling painted blue, like the sky, with stars. The western wall balcony, resting on four Corinthian columns, has the rabbi’s tebah, pulpit, under a baldachin overlooking the sanctuary and Ark. This was also the privileged place for the community’s most eminent members to sit. The poorer congregants prayed below from seats against the walls. A carved wooden panel features polychrome shell motifs, scrolls, flowers and musical instruments that could have come out of a private mansion or a church of that era. 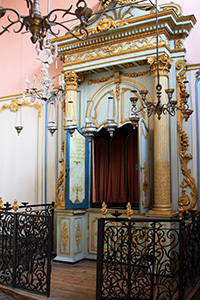 The boudoir-like interior of the synagogue in Cavaillon. Since the Ark required space for seven Torah scrolls—a prestigious possession disproportionate to the size of the small congregation—yet could only hold one, space for an extending niche was bought in the neighbors’ house. (The seven scrolls are now in the Avignon synagogue.) Close to the Ark, high above the members’ heads, is Elijah’s gilded, velvet-covered miniature chair on a rococo base of painted blue waves. The city-owned house of prayer is now a synagogue- museum, with the lowest level—where the women worshiped—functioning as the modest Jewish Comtadin Museum. Many of the exhibited prayer books, manuscripts and liturgical objects came to light in 1930, when a geniza was discovered under the eaves during roof repairs. Once the popes took up residence in this vineyard region, according to reports, some 2,640 gallons of wine were enjoyed by papal entourages in the course of one normal week. Clement VI, the bon vivant of popes, is said to have sloshed through 42,260 gallons at his 1342 coronation. Visitors today can share in the pleasures of wines from the Rhone valley by taking one of the tours offered by the tourist office. Whether or not any of the Pope’s Jews produced a kosher wine is doubtful. But today, Vignobles David (33-4-66-37-03-99; www.vignobles-david.fr) offers kosher wine tasting for individuals and groups. Though not all of its wines are kosher, more than 25 percent are and can be shipped internationally. The vineyard is about 20 minutes from Avignon in Hilaire D’Ozilhan. Internationally renowned composer Darius Milhaud (1892-1974) was descended from one of the oldest Jewish families in the Comtat region. Minister of Justice Adolphe Cremieux (1796-1880) came from a prominent Carpentras family that had migrated to Nimes; in 1870, he issued a decree granting full citizenship to Jews living in French-ruled Algeria. Alfred Naquet (1834-1916), a doctor and politician born in Carpentras, was a major force behind the French divorce law of 1890. Although Avignon has a Mediterranean climate, it can be extremely cold in winter. The best time to visit is between May and September. The Avignon Tourist Office at 41 Cours Jean Jaurès is a good first stop for comprehensive guides on lodging, dining, sightseeing, shopping and architectural heritage. (Guides are also available at www.avignontourisme.com). Hotel La Mirande (4 Place de l’Amirande; www.la-mirande.fr) offers luxury accommodations in a 14th-century cardinal’s palace. More modest is the four-star Hôtel de l’Horloge (1-3 Rue Félicien David; www.hotel-avignon-horloge.com), close to the ramparts. Michelin-star restaurant Christian Etienne (10 rue de Mons; www.christian-etienne.fr) is a gastronome’s delight, serving several fish and vegetarian entrées. Simpler, Les 5 Sens (18 Rue Joseph Vernet; www.restaurantles5sens.com) also can accommodate vegetarian and fish-only diners. The popes chose well. Avignon is one of the most beautiful, lively cities in southern France. Jules B. Farber authored The Pope’s Jews in Provence: Itineraries (Actes Sud), now available as an ebook.